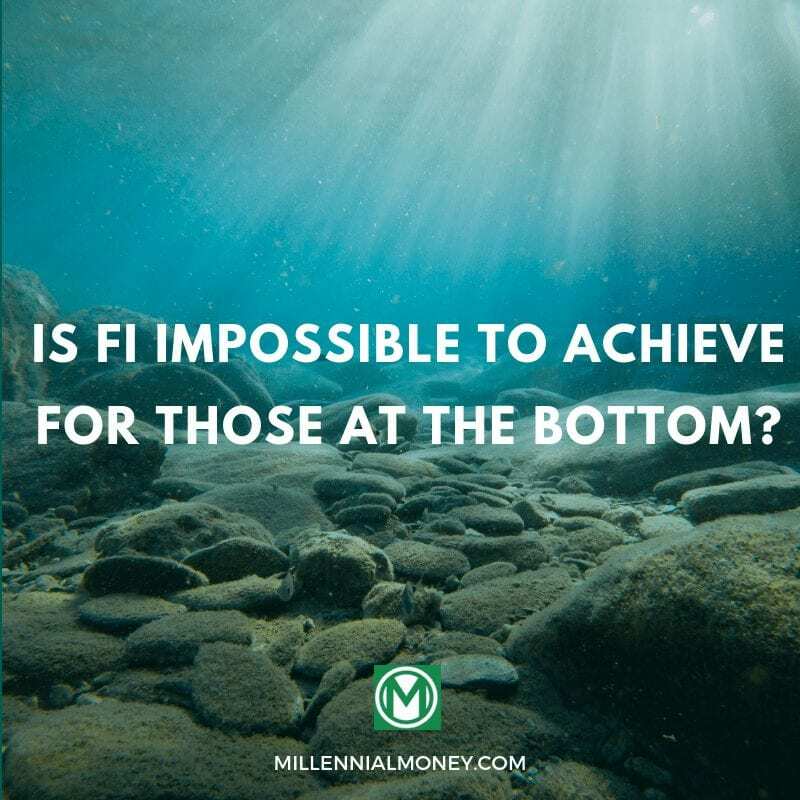 Home > Financial Independence > Is FI Impossible to Achieve for Those at the Bottom? This is an incredible guest post from Jerry who blogs about his journey from broke to financially woke at Peerless Money Mentor. While reflecting over my life, I have found this to be true consistently, especially while growing up as a child in the ghetto. A place where limiting beliefs can stunt your growth. Today I will discuss how having an amazing support system helped me overcome those limiting beliefs. In addition, I will discuss how the principles of financial independence can be used to improve the lives of those that remain in this environment. Since I was able to escape, I think it is only right that I reach back to help those at the bottom. For most people living in the ghetto, the idea of financial independence seems impossible. The primary goal is to escape and never look back. From Kindergarten to 8th grade, I lived in this environment with my mom and siblings. Although my parents got divorced in 1992, my father has always been in my life. He was around as often as possible. To make a long story short, my mom would end up purchasing a home with my dad’s help in a better neighborhood. You can read that story on my blog. Here, I want to focus more on the limiting beliefs I and many others encountered while growing up in a low-income urban community. When I was younger, I remember foolishly thinking I should focus exclusively on basketball or rapping to escape the ghetto. As a gullible teenager, I downloaded hypnosis audio tracks that promised to make me grow taller. I would go to the basketball court in my neighborhood to practice for hours, instead of doing my homework. My hoop dreams deflated after I wasn’t selected to play on my middle school’s basketball team. After that, I decided that I would focus on becoming a “gangsta” rapper. I began writing violent rhymes in my composition notebook. The problem with this career choice was that I was far from a gangster. When my father found these rhymes, he destroyed them. While growing up in the ghetto, I had to realize that my substandard living environment did not make me inferior as a person. For example, I would sometimes become frustrated while riding my bike through wealthier neighborhoods. I would wonder if my life mattered less than those who were in the bigger houses. I’d wonder why my neighborhood did not have pretty landscaping and huge oak trees. Despite not having those things in my environment, my parents and teachers would always remind me that I was somebody. They challenged me to grow. We live in a consumer-driven society so it should come as no surprise that people in the ghetto spend money on name brand items to make themselves happy. To me, there is nothing wrong with this. However, it becomes a problem when material things are prioritized above more important responsibilities like taking care of children. I cannot recall what I replied back to him. He was one of those fathers who would tell you stories of how he grew up wearing his shoes until they fell apart. Instead of listening, I would let his words go in one ear and out the other. Or get on the computer, which would take me to another world. A world beyond the ghetto. While growing up in the ghetto was far from ideal, having parents and teachers who cared about me helped me a lot. Most of my time during my middle school years were spent at home in the digital world. A world where I could build basketball websites using Geocities (does that still exist?). In this world, I could reach out to people from diverse backgrounds. I loved the internet then and I love it now because it allowed me to connect with so many like-minded individuals. Most recently, the internet has allowed me to connect with some awesome people in the financial independence community. I learned of this group’s existence over two years ago through a personal finance curation site called Rockstar Finance. After about a year of reading the content featured on Rockstar Finance, I decided to create my own blog. If you compare this online environment with the ghetto I grew up in, it’s easy to see which one is more conducive to success. While passing through the ghetto recently, I started to wonder whether some FI principles could be used to improve low-income communities. I’m aware that this would be a difficult task, but it is not impossible, right? The degree of difficulty will depend on the individual’s unique financial circumstances. I also know that financial literacy alone will not be the answer to every community problem. Since this is a personal finance site, I will stick to posting financial solutions. We will focus solely on things we can control. With that being said, let’s begin our discussion! “Education is the great weapon against exploitation” -Andrew Hallam. I agree, but not just any education. Financial education is something lower-income communities desperately need. While I understand this won’t fix all of the communities problems, it can fix some of them. But how you might be wondering? By shattering all of those limiting beliefs of the ghetto we discussed earlier. The first limiting belief we discussed was this idea that the only way out of the hood is to become a professional athlete or rapper. In the FI community, we know this is an alternative fact. In this digital age, there are countless ways to make money online. If that’s not your thing, you could learn how to create a business in your own community. That’s exactly what I have seen someone do recently in a lower income community ten minutes from my house. Mr. Horatio created a coffee shop where financial workshops are hosted. Members of the community meet there to talk business! A couple of visits ago, I overheard a financial advisor explaining to his client how the S&P 500 works! Regardless of your skin color, net worth, or place of birth, you are not inferior to anyone. In my experience, the FI community has welcomed members from a diverse background with open arms. A perfect example of this would be Jamila, creator of Journey to Launch, regularly featuring guests from diverse backgrounds on her podcast. I may be a little biased, but I think it is safe to say that the FI community as a whole has a progressive mindset. As a general rule, most people in the FI community wear the same outfit all year long. After calculating the opportunity cost of a $20 outfit, they choose to invest that money instead! All jokes aside, fashion does not seem to be very important for most people in the community. The term “stealth wealth” is frequently discussed. You might not be able to tell a person is wealthy by looking at them. Their wealth is hidden away in HSA accounts, Roths, the stock market, etc. While there is nothing wrong with purchasing quality clothing, tying your worth to name brand clothing is a recipe for financial disaster. You will never be able to purchase enough clothing to fill that emptiness inside. I know marketing campaigns have done a good job of convincing all of us that name brand clothes are a necessity. I have learned from Seth Godin that all marketers are liars. Don’t trust them. People in lower-income communities are better off investing in the most important brand in town, themselves. In reading this, I hope you have realized how having a support network (digital or in real life) can help you along your journey. I am blessed to have an amazing support system both online and in real life. Because of that, I am always thinking of ways to help others, especially those at the bottom. If you are in a similar situation, I encourage you to pay it forward by helping other people succeed. It doesn’t even have to be by giving them money. A word of encouragement can go a long way! When we work together, regardless of our backgrounds, we can accomplish amazing things. I wish you the best of luck on your financial journey. Hopefully, you find the peace of mind you are searching for! Thanks for letting me borrow your digital space, Grant! I am looking forward to reading your book Financial Freedom: A Proven Path to All the Money You Will Ever Need. Jerry has a great story. Glad to see it getting wider exposure here. When there is no security in tomorrow, what point is there in saving anything for the future? The rational person would spend their assets now if tomorrow were uncertain. But I know from Jerry’s story he did understand there was a future and felt secure because of the adults in his life. So I guess people who access financial literacy via the internet and that have a secure tomorrow can reach FI. Great post and story. I myself haven’t had the experience from growing up with nothing but my parents did make it a point to make sure I worked for everything I got including making me pay for my own college degree. 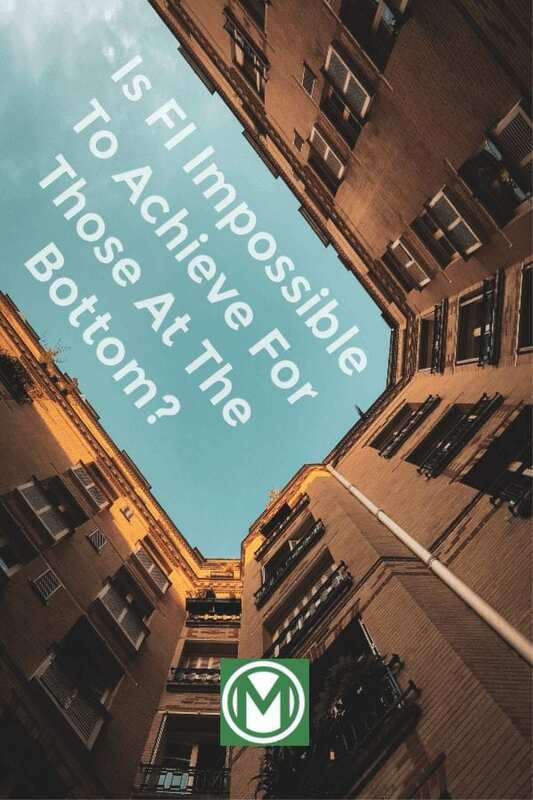 Going back to discussing if it is possible for someone to make it from the bottom, I definitely believe it is so. One of my favorite stories is the one about Ben Carson who grew up with nothing. His mother realized the power of education and forced him to read two books a week and write her a book report on each (even though she couldn’t read them herself). Now ben carson is a renowned neurosurgeon and is the US Secretary of Housing and Urban Development. A true and amazing story that shows you can go from nothing to becoming whatever you desire as long as you are willing to put the work in.